On October 16,1992, Sheena Campbell, a 29-year-old activist and feminist, was wantonly murdered by a masked gunman who singled her out as she sat with friends at a restaurant in the Queens University area of Belfast. Sheena, a law student at Queens University and the mother of a 10-year-old son, was a leading figure in the Sinn Fein party. Sheena 'was dedicated to exposing human rights violations in the North of Ireland and to furthering the struggle for self-determination there. The Ulster Volunteer Force (UVF), an outlawed Loyalist paramilitary organization, claimed responsibility for her murder. 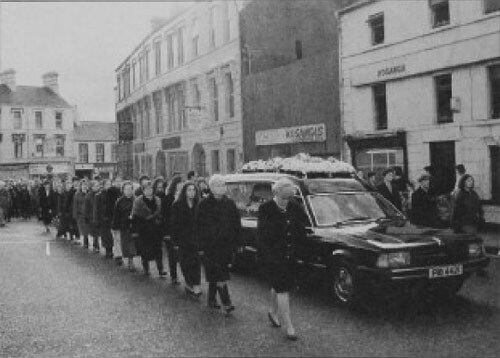 More than a thousand mourners attended her funeral in the small town of Lurgan, about an hour outside Belfast. Afterward, the funeral cortege, led by a lone piper, was accompanied by more than 500 walkers on its mile-long journey to the cemetery. Along the way, her coffin was flanked by more than 20 activist women in a dramatic show of support, strength, and solidarity. Sheena's friend Dodie McGuinness said of her: "Sheena was an articulate and astute woman. I used to enjoy watching her deal with people who tried to pull the wool over her eyes. Sheena took no nonsense, and if there was a job to be done, it had to be done properly - that was the only way Sheena knew. "She traveled to England, the United States," and as far away as Korea to promote the Republican cause and bring the truth about the situation in Ireland to many peoples. She dedicated her life to the struggle for freedom and democracy in Ireland. She carried a heavy workload in addition to raising her son Caolan. "Sheena inspired the people she worked with. Everywhere she went, to do whatever job she had been given, she became part of a team. She was always available with support and advice, not only for work problems but personal matters as well." Sinn Fein President Gerry Adams put partial responsibility for Sheena's death on the British propaganda machine which "demonizes or silences Republicans." Legal censorship exists in Britain and Ireland and Sinn Fein members may not be interviewed in the electronic media. Two days after Sheena's funeral, observing the fourth anniversary of the broadcast ban, Sinn Fein councilors staged an occupation of a Belfast radio station, demanding that the ban be lifted. Simultaneous demonstrations were held in London where Mary Pearson, spokesperson for the TroopsOut movement, said that "until the views of all parties are allowed to be heard, we will never have peace in the North of Ireland" and murders like that of Sheena Campbell will continue. I talked with longtime activist Bernadette Devlin McAliskey (see On the Issues, Winter 1992) about the wider implications of Sheena Campbell's murder. BDM: The Loyalists have a strategy of effective terrorism at the minute. Terrorism is a word like fascism that has been bandied about for so long people forget what it means; but when I say in this context "effective terrorism,"that's what I mean. The Loyalists are looking at a situation in which the Southern government is totally pliable and would concede the struggle. The Social Democrats are broken. The Irish government is broken. But in the North, we have a core group in the Nationalist population which has sustained resistance for 25 years. What is actually stopping the Social Democrats from signing and sealing the whole struggle as finished is that the Social Democratic Liberal Party (SDLP) is limited in how many concessions it can make without losing necessary electoral support. So it stands to reason to the Loyalists that the next phase has to be to terrorize the Catholics into believing that anything is better than what they've got. That was the policy in the 1920s and it worked quite successfully. By demonizing the Republicans as a political representation, they intend to literally bludgeon the Catholic population into saying "Look, just stop." At which point the SDLP will be able to simply settle for whatever is on the table. You might ask "How can people who've lived through 25 years of this violence suddenly become frightened?" They can and they are, because they know somehow that this is different. What's happening now is not just living with and round and through a war that you're not actually a combatant in. This is more terrifying than that. The Loyalists have made it clear from their actions and their statements that what is happening now is a widening of the range of the people who are going to be killed. This change in strategy doesn't make a lot of difference to people like myself, because when you widen the range of people who are targets, you lessen the risk for those of us who were always targets. We used to be one of a hundred; now we're one of a thousand. But for other people, their chances of surviving have suddenly been greatly minimized. You see, targets like Sheena are very carefully chosen. They are chosen to represent a whole class of people who hadn't been shot previously. The media continues to talk about "random sectarian killings," but there is nothing random about them: Sheena was chosen for a number of reasons. Politically, she represented the new Republican woman - a bright, working-class woman who, as a mature student, was going back into education. Sheena represented a new depth in the struggle. Her career signified that after 25 years - instead of getting tired - the movement was producing a new breed of woman - one who is a single parent, an activist, and a soon-to be attorney. Obviously, this is not what the British had in mind at all! Sheena was also a key organizer in terms of structures. She was a strategist and yet her politics were broad. She wasn't an electoralist. She could master the electoral system....but she wasn't dependent on it. She was totally open to saying at times "All right, the system doesn't work...let's do the job ourselves." Furthermore, from a military point of view, she was a maximum target with a minimum risk. Because she had to go to Belfast to study, she was out of her area. She wouldn't have known instinctively where she was safe and where she wasn't. So she was an easy target for them logistically. Then there was also the personal viciousness of the decision to target her. Her partner, Brendan Curran (a Sinn Fein Councilman), had already been shot and survived it. And he had not been scared off by it. You know, if they don't kill you, you just get up and go on. So in murdering Sheena, the Loyalists were also saying to Curran, "Well, if we don't get you, we'll get what's precious to you." It's going to be a bad year. I can see it in the increase in the number of frightened people who come to me. At an individual and family level, there is increased fear; there is intensified need for reassurance that somebody's going to hang in there; and there is a growing nervousness that the political leaders will back off. I don't know what will happen. I don't think the political leadership is wobbly, but the people want to make sure that it isn't. So the message that is going to go out to the Social Democrats is that of a massive groundswell of grassroots pressure on Sinn Fein to hold firm. What they will see is that this core has not been forced into subjection. It has been driven on down the road and is going to stand. But I think this is going to be a terrible year before that message gets through. I think we're going to see the gut core of republicanism that has come down to us from hundreds of years basically standing with its back to the wall and taking on whatever comes. I think we'll spend the year burying people. And I think we'll come out of it at the other end. I personally believe that we have it within our power to turn the wheel. What will save us is the Constitutional position that has to be fought over Articles 2 and 3. * It has to go to referendum and that gives us the opportunity to fight the issue openly and campaign for it in the South - and to raise the whole question of the British relationship and imperialism in the Southern state. That's where the main battleground will be shifted. ..to fight in that referendum. And I think we can win it. I definitely think we can win it. "But won't working on that campaign put your life in danger again?" I asked her. "Yes," she laughed. "Back to the front of the queue." * Article 2 defines the national territory as including the whole island of Ireland. Article 3 basically states that until there is reintegration of the "national territory" and without conceding the right to govern the whole nation, the Irish people will just legislate for 26 counties in the meantime.